The blame placed on anti-vaxxers for fueling this year's multi-state measles outbreak at Disneyland was likely not misplaced, a new study finds. A reported 145 people across 7 states have contracted the disease and are considered to be part of what the CDC calls a "large, ongoing outbreak" linked to the California amusement park. The question is, how did a disease that was eliminated in the U.S. way back in 2000 come roaring back? The scary, if obvious answer, according to researchers at Boston Children's Hospital and MIT, is that not enough people are getting the measles, mumps and rubella (MMR) vaccine. They worked backwards to figure out, mathematically, just how many people would have to have been non-immunized in order for us to have seen the number of cases that we did. What they found suggests that the disease couldn't have spread as rapidly as it did without help from anti-vaxxers. The outbreak, the researchers write, "shines a glaring spotlight on our nation’s growing anti-vaccination movement and the prevalence of vaccination-hesitant parents." Those parents, it should be noted, are still in the minority -- most vaccinate their children, although a worrisome number fail to do so on time. But anti-vaxxers tend to stick together, forming pockets of non-immunized populations. When the percentage of people who haven't been vaccinated drops too low -- between 96 and 99 percent, according to this study -- the population loses what's known as herd immunity, which protects those who are too young or sick to have received the vaccine. 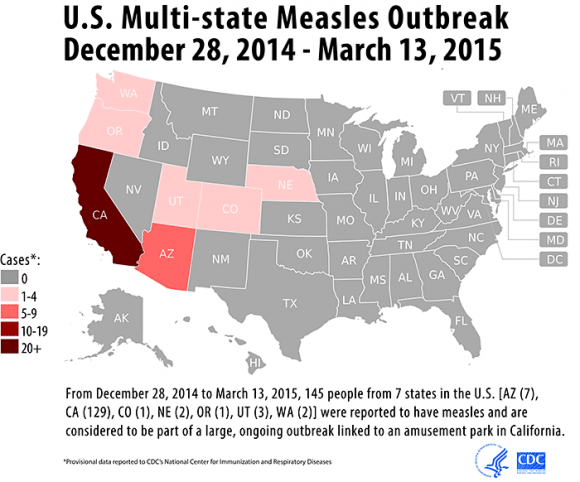 At that point, measles is able to gain a foothold. It's unclear where the Disneyland outbreak first originated, but the researchers estimated that the populations where it flourished had immunization rates that were way too low to provide herd immunity: as low as 50 percent, and probably no higher than 86 percent. "Clearly," they write, "MMR vaccination rates in many of the communities that have been affected by this outbreak fall below the necessary threshold to sustain herd immunity, thus placing the greater population at risk as well." In the process, they're ruining the Happiest Place on Earth for the rest of us.